UNESCO has placed Japanese food on its Intangible Cultural Heritage list, as representing 'the traditional culinary culture of the Japanese people.' Japanese customs regarding food are based on the Japanese spirit of treating nature with respect. What defines traditional Japanese cuisine? Due to its long north-south axis, Japan has a rich natural environment that comprises seas, mountains and various types of soil. This means that different ingredients are found and used in each region. Accordingly, many cooking methods and utensils have been developed domestically to take advantage of the flavor of the available ingredients. It is said that the Japanese diet, which is based on the 'one soup, three vegetables' philosophy, provides the ideal balance of nutrients. Moreover, skillful use of umami means Japanese cooks do not need to rely on animal oils, which in turn contributes to the long life span of the Japanese people and the prevention of obesity. Japanese cuisine is characterized by its display of natural beauty and expression of the change in the seasons. Seasonal flowers and leaves are used to decorate dishes, and specific implements and serving dishes are used to complement the season. Japanese cuisine has developed through a close relationship with various annual events. These events allow food--a natural blessing--to be shared, and by spending meal times with others the bonds within families and communities are strengthened. The principal ingredients of Japanese food are rice, grains, vegetables, mushrooms, fish, shellfish and seaweed. More recently, delicious cuts of beef have been added to the list. The rice comes in two types, non-glutinous uruchi rice for cooking and glutinous mochi rice. A wide range of vegetables is used, from those existing since ancient times to newer Western vegetables that entered the country in the Meiji Period. The fish in Japanese cuisine are similarly diverse, with as many as 4,200 species from the seas around Japan being used to create Japanese meals. Cooking Japanese food often involves use of abundantly available water, whether for steaming, boiling or stewing. Moreover, cooks use specialized knives to prepare different kinds of fish, and use dashi stock with great skill to make vegetable and fish-based meals even more delicious. The traditional Japanese meal is based on the philosophy of 'one soup, three vegetables.' What gives these meals their strength is the natural flavor of the basic ingredients. Dashi is very important in the preparation of Japanese cuisine. It is prepared from kelp (konbu) or small pieces of sliced and dried bonito (katsuobushi), or sometimes by stewing other ingredients. Delicious meals are always presented in a beautiful way. A traditional Japanese meal is low in animal products, consisting rather of a staple such as rice, a main dish and side dishes. This provides the ideal balance of nutrients for a healthy, energy-filled life. By alternating between the staple and the side dishes, each diner can achieve the perfect balance of flavor. This is a trait peculiar to the way Japanese food is consumed. Careful use of umami means that meals can be low in both salt and calories. Hospitality in the context of Japanese food is not about the service provided by a host to customers. Rather, it is about the entire culinary experience. For example, the dining space may have a certain layout, and certain concepts or ideas may be hidden in the food or the dishes served. When the guest notices these during the meal on that particular day, appreciation for the hospitality can be felt also by the host. Japanese food is arguably the most important part of Japanese culture. When preparing vegetables in the Japanese style, many techniques are available, from stewing, to grilling, steaming, boiling, dressing in sauce and deep-frying. By bringing together seasonal and wild vegetables, seafood, and seaweed, the dining table can be decorated with a rich variety of food. Stews: Stews are seasoned as they cook. Grilling: Grilling by direct flame is performed at a distance and at high temperature. Other techniques may use an indirect flame. Boiling: Noodles made from wheat or buckwheat flour are usually boiled. Raw food: Raw fish (sashimi), arai (a special type of sashimi), vinegared and pickled dishes are all used. Ae-mono: fish, shellfish and vegetables are dressed with sauces made from sesame seeds, miso, or vinegar. Deep fried food: When Japanese cuisine contains fried food, it is usually deep fried in oil at 150-200 degrees. Steamed food: Steamed food is prepared by boiling water and using the resulting steam to heat the food. Hitashi-mono: Usually beans or vegetables steeped in a flavored sauce. Soups: Various soups are made with dashi as the principal ingredient, including clear soup, miso soup and thick soups. Pickles: Pickling is one way of preserving raw food. As well as pickling items in salt, Japanese foods are pickled through lactic acid fermentation. In the Showa period, the average lifespan of a Japanese man or woman was less than 50 years. 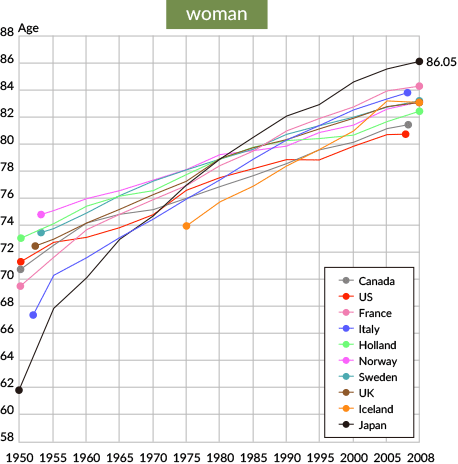 In the simplified Life Expectancy Table from 2008 this figure rose dramatically to 79.29 for men and 86.05 for women. Figure 1 shows the average life span of people in different countries. 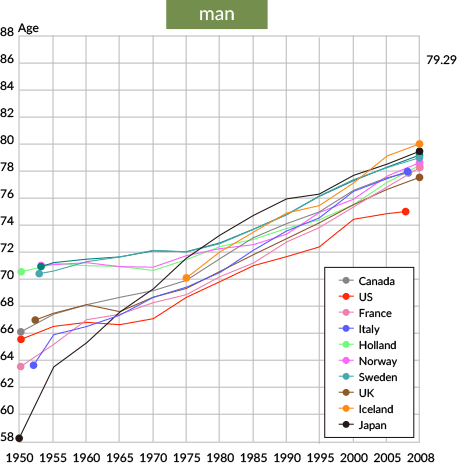 Japanese women occupy the number one position, and Japanese men occupy the number two position, making Japan number one overall for life expectancy. One cause of the increase in lifespan in Japan has been the reduction in the infant mortality rate. However, it is the unique Japanese diet that has made the Japanese life expectancy the highest in the world. The base of the standard Japanese diet uses ingredients familiar to the Japanese people to create meals centered on the traditional arrangement of a staple, a main dish and side dishes. These foods are combined with light flavorings that make use of the natural flavor of raw ingredients and other basic elements, and their refined presentation defines the Japanese culinary style, which has come to be highly regarded around the world. The Japanese diet brings together domestically produced rice, seafood and seaweed from the seas around Japan, as well as soybeans, vegetables, fruits, milk and much more. This combination of foods has brought down the adult mortality rate and made the average lifespan in Japan the highest in the world. Compared to the Western-style diet, which is rich in wheat flour and meat, the Japanese diet tends not to provide energy in excess and is low in fat and calories. Nevertheless, it provides an excellent nutritional balance that is ideal for staying healthy. Moreover, the Japanese diet can reduce the burden on the environment through efficient use of sustainable agricultural resources, which are an integral part of the Japanese lifestyle and culinary culture that has taken shape over Japan's long history.